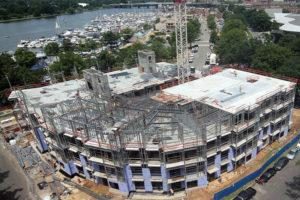 The Wharf development is transforming Washington DC’s storied Southwest quadrant by creating a mile-long waterfront neighborhood that includes retail, residential, hospitality, offices and cultural complexes as well as a public park and piers. 525 Water is a 107-unit condominium building in Washington, D.C. and the first residential project to be constructed in The Wharf. These new condominiums extend five stories above grade and contain over 105,000 square feet. Final punch list items were completed in July 2016 with a construction cost of $30 M.
The project consisted primarily of load-bearing cold-formed steel framing. The load-bearing wall panels support concrete over Hambro joists for levels three and above. Over 9,000 linear feet of wall framing containing complex curves and angles was prefabricated off-site by FrameCo, Inc. On May 5, 2015, the first of over 1,040 panels was placed on the second floor. In just three months, the structure was topped out with its final pour at the roof. Although masonry elevator and stair shafts were included in the building design, cold-formed X-braces stabilize the building above the second level. The garage and first-level structure were constructed with concrete columns supporting reinforced two-way concrete slabs. The first story exterior wall is infill curtain wall fabricated with cold-formed steel framing and deflection track at the top of the wall. These curtain walls were installed after much of the second story was already in place. Combining attention to detail with innovative design, Excel and FrameCo demonstrated that prefabricated cold-formed steel systems can work perfectly as the primary structure for any mid-rise building. 525 Water was recently recognized by the Cold-Formed Steel Engineers Institute with a 2016 CFSEI Design Excellence Award for its’ innovative use of cold-formed steel.